Many scientists say that disposal wells used during hydraulic fracturing and other methods of oil and gas extraction are the culprit. A dramatic uptick in earthquakes has been shaking central Oklahoma this year, continuing a recent trend of unusually high earthquake activity in the state and leading scientists to speculate about a possible link to oil and gas production there. No one is disputing that such a dramatic spike is unusual. The question is why it’s happening now, and science suggests that the fracking boom may be, at least in part, to blame. Scientists have drawn links between earthquakes and wastewater injection wells used for oil and gas production, including fracking. Researchers say the toxic wastewater, stored thousands of feet underground, reducing friction along fault lines, which can trigger earthquakes. The ongoing fracking boom has led to a growth in national demand for disposal wells, according to Bloomberg. A 2011 study, published in the journal Geology, found that liquid injection triggered a sequence of earthquakes in Oklahoma, including the largest quake ever recorded in the state, which injured two people and destroyed fourteen homes. StateImpact reports that Oklahoma is home to more than 4,400 disposal wells. (The website is a great resource on this issue.) 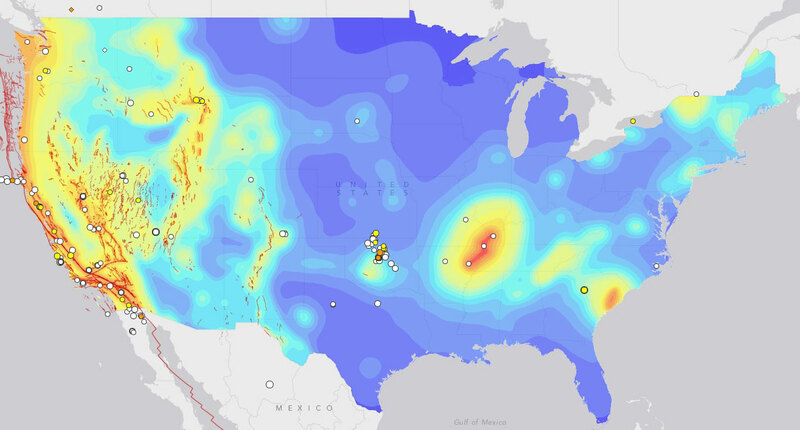 Researchers have also found connections between injection wells and earthquakes in Arkansas, Colorado, Texas and Ohio. The science linking quakes to disposal wells has led some states to take action. In 2011, Arkansas banned the use of drilling wells in a 1,550-square mile region because of earthquakes. Ohio banned the use of disposal wells near fault lines altogether. Most recently, Kansas Governor Sam Brownback commissioned a task force to study the link between earthquakes and drilling activity. CORRECTION (02/19/2014): An earlier version of this post stated that there have already been more than 150 earthquakes in Oklahoma this year. 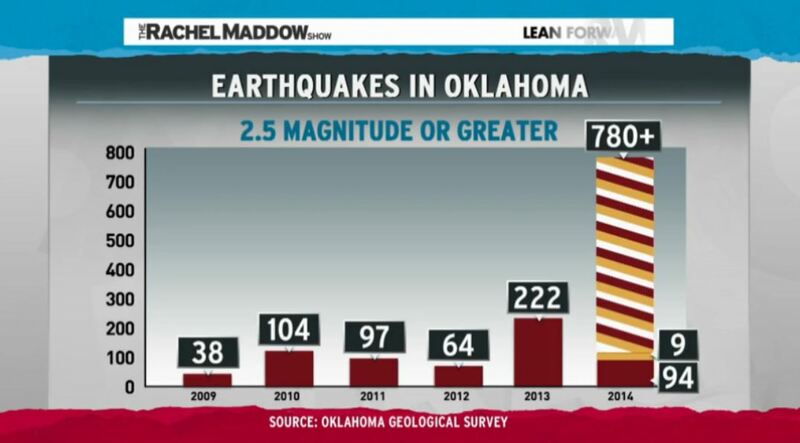 In fact, there have been more than 500 earthquakes in Oklahoma this year and 150 last week.